Westville First Church of Christ is a small, but growing, church. We are an evangelical church; we believe what the Bible teaches and follow that as our guide through life. Some small churches have trouble accepting newcomers, however, we are delighted to have visitors and those looking for a church home. If you want to come to a church and not be noticed, this is not the church for you. If you want to be welcomed into a family, this may be the church for you. We offer times to worship on Sunday in the morning and evening. We also have small groups that meet together to build relationships, study the Bible, and enjoy dessert. All are welcome to participate. We also reach into our community by operating a food pantry for those who need help with food. We believe that is another form of worship, by helping those whom He loves. Throughout the year we gather for a special event that are appropriate with the season. This is usually a time of fun, food, and fellowship and worship where we can grow together. 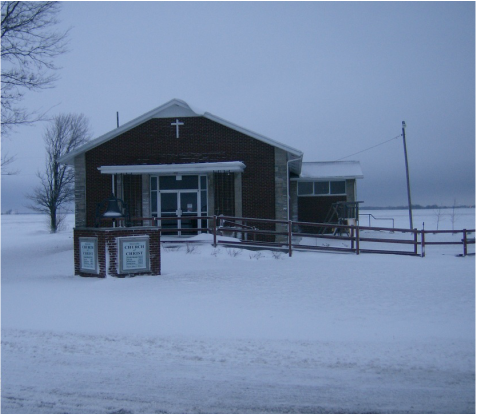 Photo of Church after a snow storm.